Three years ago, Melanotan injections became available on the market, adding to the already varied offer of tanning products, such as spray tans, lotions, gels, creams, foams, and the increasingly popular tanning tablets. For many tanning addicts, these injections – which can be comfortably purchased online – seemed a safe and easy tanning method. But are there any hidden dangers we should all be aware of? How do Tanning Injections Work? Melanotan is the synthetic version of the hormone responsible for producing melanin, the pigment that gives colour to our skin and protects us from the aggressive action of the ultraviolet rays. There are two available types of injections: Melanotan I and II. The Melanotan powder is reconstituted using sterile water. 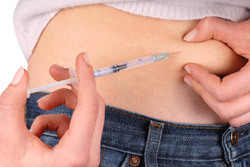 The obtained compound is afterwards injected under the skin, in the abdominal area. Many men and women have already used these injections, despite the fact that the product is considered illegal in many countries. In the UK, the Medicines and Healthcare Products Regulatory Agency has not regulated the use of this product. What are the Tanning Injection Side Effects? The British authorities say that tanning injections have not been licensed for use due to the fact that their efficiency and safety have not been sufficiently tested. This basically means that the adverse effects of the tanning injections are not fully known. So far, according to the testimonies of those who have used Melanotan, this injection can be associated with depression, lack of appetite, nausea, high blood pressure, and even panic attacks. However, skin cancer is the most feared side effect. According to the British Medical Journal, many women have requested assistance from dermatologists after noticing that, several weeks after using the Melanotan injections, the moles on their bodies had increased in size and had become darker. In addition to the possible side effects of Melanotan, there are other dangers worth considering. The use of non-sterile water to prepare the injectable substance increases the risk of serious blood infections and abscesses. Also, if administered by untrained persons, these injections can cause skin and tissue damage that can lead to permanent injuries. How much are you willing to risk for a perfect tan? Until the Melanotan injections are actually licensed for use and their side effects are fully known, we recommend safer tanning products such as the tanning pills.